Synopsis: Comicdom’s top Western reprint anthology returns with twelve classic stories starring the comics versions of the top movie, TV and radio cowboys of the era’s heyday, the 1950’s. 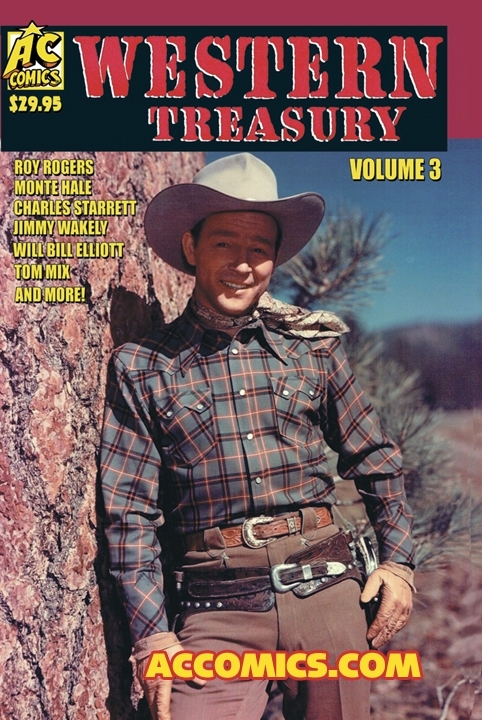 This issues’ stars include ROY ROGERS, DURANGO KID, JIMMY WAKELY, MONTE HALE, GENE AUTRY, HOPALONG CASSIDY, WILD BILL ELLIOT and TOM MIX! As popular and ubiquitous as superheroes are in movies, television and media in general today, the great American cowboy was the most popular icon in entertainment during the period between the late 1940’s and mid-1960’s. Strapping on a pair of sixguns, sporting a ten-gallon hat and standing up for justice in the Old West was the romantic fantasy of the era. Virtually all of the range-riding stars of the day eventually got their own comic book series, many boasting long runs and impressive sales through the Mid-Century era. AC Comics WESTERN TREASURY recaptures that glory by presenting twelve of the best tales of that time in this big, 100-page third-issue. Thrill to the expoloits of ROY ROGERS, The DURANGO KID. JIMMY WAKELY, MONTE HALE, TOM MIX, Wild BILL ELLIOT and others, featuring the artwork of industry giants including Alex Toth, John Buscema, Joe Certa and more. The Western genre in comic books today is virtually defunct; check out these classics and see why it was huge in the pop culture world of 60 years ago. That’s Western Treasury Volume 3, 100 pages of top-quality reprints in black and white (with color covers) from AC Comics for $29.95 2019.